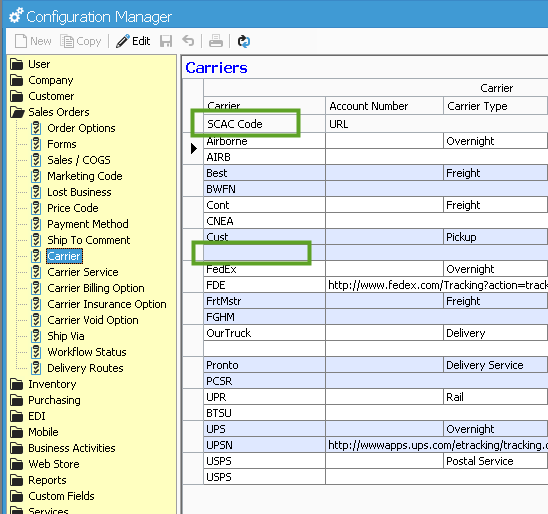 In Package Manager, when processing shipments, selecting the Carrier for the shipment doesn’t display all of the Carriers configured in Configuration Manager -> Sales Order -> Carriers. This may be due to the Carrier configuration being incomplete. EDI Manager, which is commonly used in conjunction with Package Manager, typically requires the Carrier SCAC Code to be included in the EDI Advance Shipping Notice (856) document. To resolve this issue, open the Carrier window in Configuration Manager and enter in the proper SCAC code for the Carrier in question. Once you save and exit Configuration Manager, you will be able to select the Carrier from the Carrier dropdown on the Shipment record in Package Manager.